The whole world is on a campaign against plastic waste. Some rely on legal prohibitions, others argue for practical alternatives or develop tools to clean up the oceans. 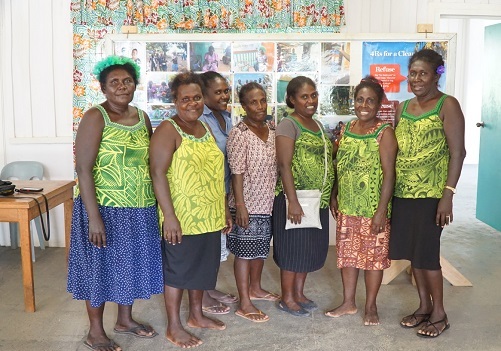 A group of women in the Solomon Islands in the South Pacific are using their creativity as a weapon against the overwhelming pollution of their island. Elegant floral arrangements adorn one of the tables. On another, bright yellow garlands sit next to greeting cards while earrings in all the colours of the rainbow are laid out on a third table. 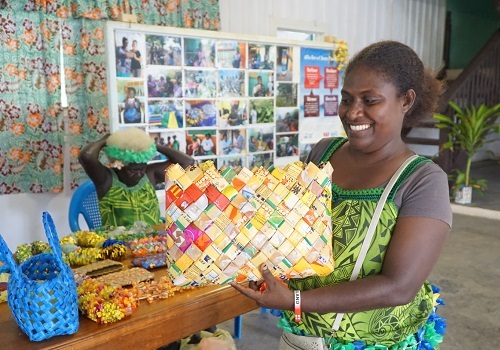 “Men throw away plastic, we women collect it and make something beautiful out of it,” Josephine says with a mischievous grin and proudly shows me her orange earrings. 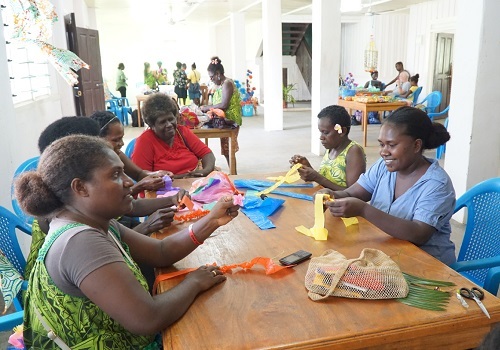 “I got them in an exchange for a bag I made out of an old umbrella.” The plucky lady is one of thirty women who have gathered in the town of Gizo in the Western Province of the Solomon Islands to introduce me to their products. Products that are all made from recycled plastic. There is a lot of it on the island of Ghizo. Shiny biscuit wrappings, bags used for milk or cream that people put in their teas, green Sprite bottles – plastic waste has long become part of the streetscape in the archipelago, which is often hit by earthquakes and tsunamis. “We do not have any waste management here,” complains Rendy Solomon, chief environmental health officer for the region and founder of Plasticwise Gizo. Four years ago, red wooden rubbish sites were set up to collect household waste and transport it weekly to a waste depot. The overflowing rubbish sites, however, demonstrate (in a quite visible and smelly way) the failure of that idea. It is not the only thing that works better on paper. On July 1, 2018, the region issued a plastic ban. Silently, it seems, because, without information and legislation, it remains another ineffective attempt to master the piles of plastic effectively. Plasticwise Gizo is the best proof of that. Since Solomon founded the group with the support of volunteer Yuko Furukawa from the Japan International Co-operation Agency, a lot has happened. 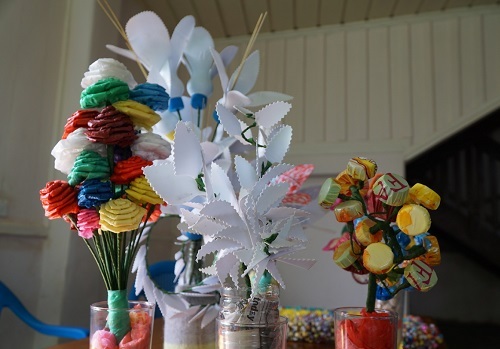 Collective street cleanups, school projects on waste disposal, radio programs on proper waste separation, compost- and plastics-handicraft workshops and markets, where the creative recycling products are sold – the number of activities the group has initiated could make you dizzy. What began in May 2017 as a small five-women team has grown at record speed to a professional club with over 100 members – including three men. 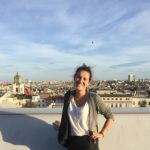 Meanwhile, as part of the Networks for Sustainable Environment, the group not only works with 15 local NGOs and UN Women but was also recognized by the Australian organization Plasticwise as its first international branch in August 2017. Now, Plasticwise Gizo is looking for donations and funding for their activities. The financial part is just one of the challenges Solomon faces in the near future. 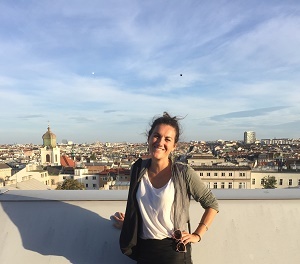 As a freelance journalist, Doris Neubauer has followed her itchy feet: she volunteered in communities in Hawaii, built a mud house in Uganda and sailed around New Zealand. Her main inspirations are people that want to change the world.